The apostolate of the Society in the Philippines began when the late Atty. Teodoro Dominguez wrote a letter to Archbishop Lefebvre just after the 1988 Consecrations hoping that another Bishop be consecrated and sent to the Philippines since the faithful there, though silent but suffering, were waiting for the return of the Traditional Mass. The first priest of the Society to visit the country was Fr. Patrice Laroche on 13th August, 1988. Mgr. Williamson also passed by in August of 1989, and then Fr. Laroche returned in August of 1990 and 1991. However, in October 1991 Mgr Fellay came looking for a building both for our apostolate and the possible transfer of some foreign seminarians from Holy Cross Seminary who had difficulties with their visa. In January 1992, Fr. Gentili visited also. Finally, Fr. Laisney District Superior of Australia and in charge of the missions in Asia came at the end of June 1992. Some days later in July, Fr. Paul Morgan visited the country also. The most awaited day of foundation arrived on 18th August, 1992 when Fr. Paul Morgan and the newly ordained Fr. Stephen Abraham came to lodge themselves with the Malaya Family. A few weeks later, they rented a house in a squatters’ area in Banawe, Kabignayan, Quezon City. Here the first Ignatian Retreat was preached to 50 men. But, as early as 28th August, 1992, Jaime Cardinal Sin, Archbishop of Manila, issued a Circular Letter directing all the Catholic faithful, religious and clergy from any of the Catholic institutions of Manila to keep away from this schismatic group and that no member of the Catholic faithful is allowed to have any association or affiliation with this group. To this accusation, the retired Dean of the Faculty of Philosophy of the University of Santo Tomas, Fr. Manuel Piñon, OP preached to defend the Society. He even told the faithful who frequented his Indult Mass to support us since he is very old and weak already. On the other hand, Atty. Dominguez wrote a letter to the Cardinal refuting his accusation of schism. In 1993, the community was reinforced by the coming of the Fathers: Roland de Merode, Paul Carr, Arnaud Rostand and Thomas Onoda. Basically, Fr. de Merode took the mission trips of Singapore, Malaysia and Sri Lanka. Fr. Onoda was in charge of Japan and South Korea. Fr. Rostand went regularly to Hong Kong while Fr. Carr helped Fr. Morgan with another group of faithful in Iloilo City and Koronal City in Mindanao. Later that year, a lot was bought in New Manila and the construction of the Church and the Priory began immediately. Unfortunately, these constructions had to be stopped and begun again on three occasions due to lack of funds. However, in June 1994 the community transferred to the basement of the Church-in-construction and in August Fr. Thomas Blute came to replace Fr. Carr. Mgr. Williamson came to give Confirmations in March 1995 and that was the first meeting of the Society with a retired Diocesan Bishop who latter joined our fight, Mgr. Salvador Lazo, Bishop Emeritus of San Fernando, La Union. Later this same year Fr. Rostand left the Philippines to open a Priory in Sri Lanka with Fr. Luc Davodeau. He was replaced by the newly ordained Fr. Vicente Griego. In 1996 the Priory of Manila became the seat of the District of Asia and its new District Superior was Fr. Daniel Couture. In this year Mgr. Salvador Lazo fully joined the fight of Tradition becoming the guest of honour in the celebration of the th 400 anniversary of St. Gonçalvo Garcia in India, he also went to Melbourne, Australia and to the Ordinations in Econe that year. Fr. Santiago Hughes a priest of the diocese of Antipolo also joined us on 4th November as resident priest in Manila. On 1st March, 1997 the Church of Our Lady of Victories was solemnly consecrated by Mgr. Fellay. Some time in August Fr. Michael McMahon came and took charge of St. Bernard’s pre-seminary in Manila. The youth group, Apostles of Mary, was founded by Fr. Marc Vernoy in Cebu, while in Manila a house called Bethany for girls aspiring to become Sisters gradually took shape. In 1998, a big drought caused by “El Niño” affected the whole country. A house beside the Priory was burned and the flames start to touch the Priory itself. Just in time, the Fathers had just bought an ivory statue of the Sto. Niño from its sculptor. On the suggestion of Mgr. Lazo, the Fathers and the pre-seminarians made a procession of the Sto. Niño amidst the fire-trucks and the people. Suddenly, the direction of the wind changed and rain came to end the drought! Isn’t this a visible intervention of the Sto. Niño, blessing our work? Moreover, 16th July, 1999 was a big day for the Philippines because Mgr. Fellay ordained the first Filipino priest of the Society, Fr. Joven Soliman, in our church in Manila. In August of that y e a r , s o m e Filipinos with Mgr. Lazo and Fr. Couture joined the S o c i e t y ‘ s p i l g r i m a g e i n F a t i m a . B y October, Fr. Benoit Wa l l i e z , t h e Vocations Director transferred St. Bernard’s Preseminary to its present location in D a g a , S t a . Barbara, Iloilo. Another priest of the Diocese of Laguna joined us, Fr. Edgardo Suelo. Together with Frs. Walliez, Soliman and Fr. Marie Dominique,OP they formed the staff of the new Pre-seminary. 1999 was not without blessing, for on 29th June that year another Filipino was ordained in Econe, Fr. Emerson Salvador. Later this year the District Superior transferred his seat and opened the Priory in Singapore. The Jubilee Year of 2000 brought some Filipinos to join the Society’s Pilgrimage in Rome. When they arrived there on 5th August, Fr. Griego was able to celebrate the Mass for the Asian pilgrims in Rome’s Filipino Centre, the Basilica of Santa Pudentiana. On 15th August that year, the Asian pilgrims were able to visit Econe and Mgr. John Bosco Manat of Ratchaburi, a friend of Mgr. Lazo celebrated the Mass in the new Church of Econe. When they came back to the Philippines in September, the First Provincial Chapter of the Knights of Our Lady was held in St. Bernard Noviciate. On 17th December that year, in our seminary in La Reja, Argentina Fr. Aurelito Cacho was ordained. The year 2001 struck a sad note for the Philippines. On 11th April, God called Mgr. Salvador Lazo to His eternal reward. But the God of consolations gave us a th new priest on the 29 of June in Econe through the ordination of Fr. Carlo Magno Saa. th In 2002, we celebrated the 10 anniversary of the Society in the Philippines with a meal for the faithful and a musical concert by the Choir of Our Lady of Victories and some musicians from the University of the Philippines. In August of that year, Fr. Loren Gerspacher took over St. Bernard’s Noviciate and Preseminary. The year 2003 was a year when 2 priests came to us to learn to celebrate the Tridentine Mass: Fr. Elijah a Franciscan Conventual and a military chaplain Fr. Bantigue. In St. Bernard’s Novitiate, Br. Hyacinth was twice shot by robbers who wanted to get the water pump. Providentially, it was only his arm which carried the rosary that was hit. Nevertheless, he had to undergo an operation during which the doctors removed 18 bullets from his arms, 2 of these nearly penetrated his lungs. 2004 was a year of construction. A Primary School was opened in the basement of Our Lady of Victories Church in the month of June. Mgr. Williamson came to bless our new church dedicated to St. Pius V in Mandaue City on the island of Cebu on 5th August. Also in the same month, Fr. Joseph Lester came to the Novitiate to replace Fr. Cacho. Then on 17th October, Fr. 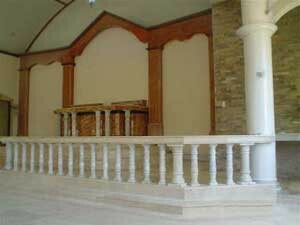 Couture blessed another Church in Jaro, Iloilo City dedicated to Our Lady of Consolation and St. Joseph. Sad to say that on 28th November, God called Fr. Santiago Hughes to Himself. The loss of Fr. Santi, as we called him, was gravely felt in Manila, because instead of having 3 Masses in our big Church on Sundays, we have to be content with a Sung Mass in the morning and a Low Mass in the evening. 7th March, 2005 was the beginning of the annual Priests’ Doctrinal Session in Manila. The next day, however, after all-night adoration, all the Fathers headed by Fr. Couture and some faithful made a rally going to the Legislative House to oppose the project Bill 3773 which will implement the 2-child policy and obligatory contraception in the country. In the month of April, Pope John Paul died and Cardinal Ratzinger was elected Pope taking the name Benedict XVI. In August, Fr. Lester was transferred to Singapore to become the District Bursar; while some Filipinos with Fr. Couture and Fr. Saa went to Fatima to join the reparatory pilgrimage of the Society for the construction of an Ecumenical Basilica. In this month also, the faithful of Iloilo, as well as the Brothers and pre-seminarians of St. Bernard bade good-bye to Fr. Gerspacher who was assigned back to Canada while Fr. Adam Purdy was welcomed to take charge of the Novitiate and the Visayas missions. A new priest was also assigned to Iloilo, the Australian-Libanese Fr. Sayed Elias. Finally, on 27th December, 3 new Filipino priests were ordained at Holy Cross Seminary in Australia: Fathers Albert Ghela, Gerard Fallarcuna and Roy Dolotina; moreover in La Reja, Argentina, a Filipino deacon was ordained Rev. Mr. Fidel Ferrer. Hopefully with the readers’ prayers, he will be ordained to the Priesthood this coming December 2006. Presently, the apostolate of the Society is partitioned this way: the Fathers in Manila take charge of our big Church there, the Bethany, the Primary School, as well as the Mass Centres in South Korea and Japan; Baguio City and Tanay, Rizal in the North, as well as Davao City, General Santos City, and Koronadal City in Mindanao. On the other hand, the Fathers in St. Bernard’s Novitiate, besides giving courses to the Brothers and Pre-seminarians, also take care of the churches in Jaro, Iloilo City and Mandaue City. Moreover, they go to missions in Bacolod City, Tagbilaran City and Butuan City; they also make circuits to Mambusao, Capiz; Dagohoy, Bohol and Bato, Leyte. Concerning the various lay-organizations, the biggest and the most active is the Legion of Mary which is composed of 3 Curiae, one for each part of the country, each Curia is composed of 6-8 Senior Praesidia with 1 or 2 Junior Praesidia under them. There are 2 organizations for men namely, the Knights of Our Lady and the Holy Name Society. As for the youth groups, we have the Cristeros of Manila for boys and young men; the Archconfraternity of St. Stephen for altar servers and a mixed group of the Apostles of Mary like the MJCF in France. We have also various Tertiaries, that of the Society, the Discalced Carmelite Tertiaries and the Dominican Tertiaries. Such then is the big work of the Society in the Philippines these past 14 years. As we can observe, the buildings and the faithful are already there (like in Jaro, Iloilo City and Mandaue City). But what we lack are resident priests. Tagbilaran City and General Santos City are also looking forward to constructing their church and Priory. So, let us all pray for more priestly and religious vocations to serve not only the Philippines but the whole world. Let us include in our daily rosary the perseverance of our priests and religious – the Brothers, Sisters and Oblates of the Society. We can rest assured that God will not be deaf to our prayers nor be vanquished by our generous sacrifices for this purpose.